We are pleased to announce that new training workshops are now available in the autumn for palliative care services planning to implement the Carer Support Needs Assessment Tool in a UK setting. This carer-led approach to assessment and support is a change from usual practice in palliative home care and is therefore supported by a training package. 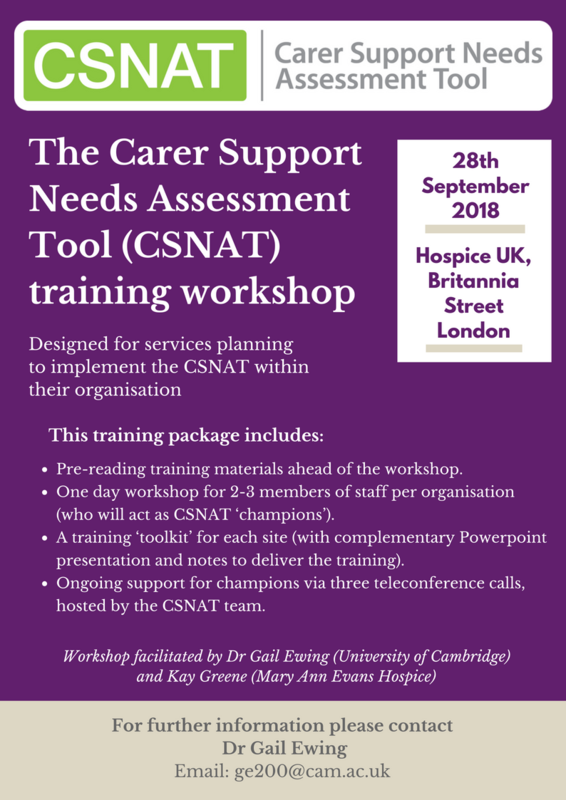 The workshops will be facilitated by members of the CSNAT research team and Kay Greene, Director of Clinical Services at Mary Ann Evans Hospice who has extensive experience of implementation of the CSNAT Approach in practice. The first workshop will be on 28th September 2018, Hospice UK, Britannia Street, London.